Well here I was one week later on Horseshoe. The temperatures were up and down all week and as I arrived I didn’t feel too confident. I fished a good swim where I’ve caught before. Now as I set up I had a friend Graham call me on the phone from across the lake he was fishing for carp and I could see him in the distance. I put out some dead maggots and hemp and it didn’t take long before first the mallards came and dived for the bait. Yes it was that shallow. I didn’t hook any of these, but as the tuffties arrived things hotted up. There were 20 of the lovely things diving on the baits at 56 yds. Soon I had a string of the lucky ducks coming to the net. As there were so few angler’s on the lake they tended to concentrate on your bait. I thought that there were about 100 maggots in the feeder so 5 dives each of the ducks would clear me out. So after 5 ducks later I felt sorry for them and moved swims further down the lake. 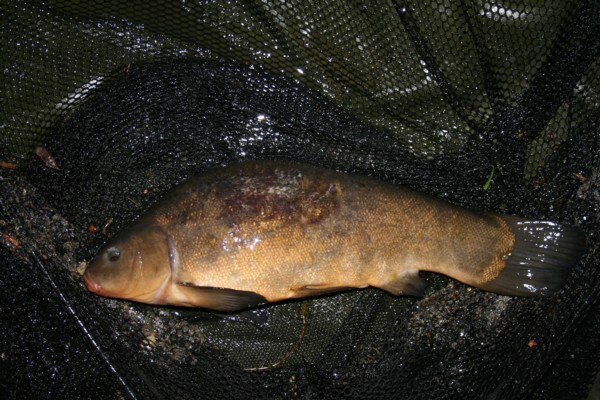 But before I moved and at 5.30am I caught one very small tench in terrible condition that I saw roll over he baited area 5 minutes before it took the bait. The time will come I’m sure that the bigger fish will show. But not for this time, 48 hrs and not much to show for my efforts. Never mind as they say in the “Fields of Dreams build the swim and they will come”. Well not quite like this but close. This entry was posted on Thursday, April 12th, 2012 at 10:00 pm	and is filed under Uncategorized. You can follow any responses to this entry through the RSS 2.0 feed. Both comments and pings are currently closed.